(NaturalNews) More than one-third of women and one in ten men regularly color their hair. If you are one of them, then you may be slowly poisoning your body with highly toxic compounds linked to allergic reactions and several types of cancer. According to the Daily Mail, British scientists from Leeds-based company, Green Chemicals, warn that home hair coloring kits, as well as the dyes used at expensive salons, pose a potential risk to your health. 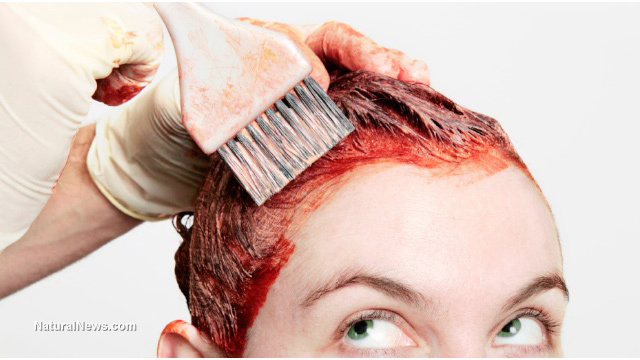 They report that chemicals found in permanent hair dyes react with tobacco smoke, exhaust fumes, and other pollutants in the air to form highly toxic, cancer-causing compounds called N-nitrosamines. While N-nitrosamines have been banned from cosmetics, other chemicals that generate these carcinogenic compounds via a simple reaction, are still being used freely. "Professor David Lewis, one of the authors of the study, and an expert in the chemistry of various dyes, said: 'At this stage, we can't be sure of the amount of N-nitrosamines produced or the level of risk these compounds pose but it is clear a potential hazard exists,'" reports the Daily Mail. The cosmetic industry disputed the claim, and stated that the use of these secondary N-nitrosamines, known to react with airborne chemicals, is forbidden by law. A spokesman for Green Chemicals is not so sure if other cosmetic companies take this law seriously. He said that despite numerous studies on the subject, the danger posed by the chemicals in hair dye reacting with the air has been missed or ignored until now. With an aging population, scientists fear that the use of hair dyes will dramatically increase over the coming years. To be absolutely sure no chemicals end up in your hair, try and use coffee instead, or make peace with those gray hairs. Natural dyes, such as coffee, may not last as long, but at least they won't add toxins to your body and increase the risk of allergies or cancer. Coffee has the ability to give all hair colors an incredible shine. It deepens light blond or dark blonde hair, and highlights darker brunette hair, giving it a beautiful chocolate color. 1) Brew a cup of strong, organic coffee, preferably espresso. Allow to cool to room temperature. 2) When cool, stir in 2 cups of leave-in, all natural conditioner; 2 tablespoons coffee grounds; and the cup of now cold, brewed coffee. Whisk well until combined. Make sure to opt for an organic conditioner to avoid added chemicals. 3) Apply the mixture to your hair and leave for about an hour. Rinse well with water. If you don't see the desired effect after the first attempt, simply repeat the procedure for a few consecutive days, until you do. According to a study published in the International Journal of Dermatology, coffee may be beneficial for hair growth. If you are just looking to create a lusher look without adding color, regularly use this simple coffee rinse instead. Wash your hair with a natural shampoo first, then pour a cup of coffee over your hair and gently scrub your scalp with it. You may add coffee grounds to boost hair color, too. Leave for 20 minutes. Apply apple cider vinegar to rinse the coffee out of your hair and add extra gloss, and then rinse with warm water. Note of caution: if you are going to make coffee a part of your regular hair care routine, you may want to place a cloth or coffee filter over the shower drain to avoid the coffee grounds clogging up your pipes.